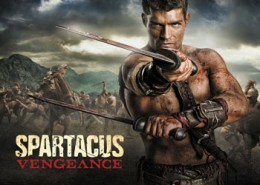 2013 Rittenhouse Spartacus Vengeance Premium Pack is the company's third premium pack offering for the cable series. Every pack delivers what a typical box might, minus the piles of base cards. Each has two autographs, a relic card, a Die-Cut Gold Plaque card and three "base" cards. 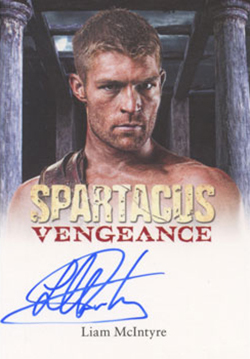 The main focus of this new series is Spartacus: Vengeance, although some of the autographs are from Spartacus: Blood & Sand. Signers for the set include Liam McIntyre, Viva Bianca, Cynthia Addai-Robinson, Katrina Law, Tom Hobbs, Kevin J. Wilson, Brooke Williams, Conan Stephens, Craig Parker, Peter Mensah, Craig Walsh Wrightson, and Dan Feuerriegel. Making their debut as an in-pack insert are relic cards, which include pieces of costumes and props used in the show. 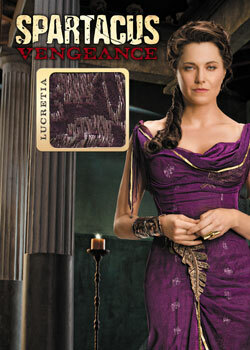 Collectors can look for wardrobe swatches from Lucy Lawless and Viva Bianca. Props include whips, maps and documents. 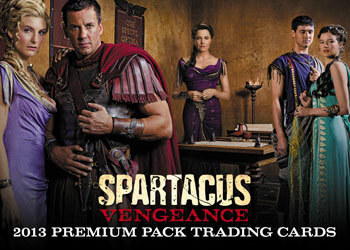 2013 Rittenhouse Spartacus Vengeance Premium Pack boxes come with a Vengeance Plastic Poster card inserted as a box topper. Those ordering two boxes get an exclusive map relic. The four-box incentive is an autograph card from the show's creator, Steven S. DeKnight. An Archive Box of all pack-inserted cards is the eight-box incentive. 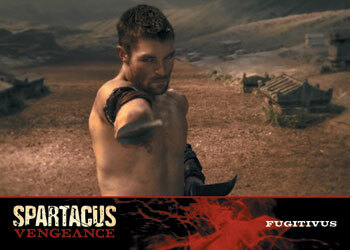 2013 Rittenhouse Spartacus Vengeance also has a custom binder that comes with an exclusive promo card. 18 cards. Inserted 2 per pack. 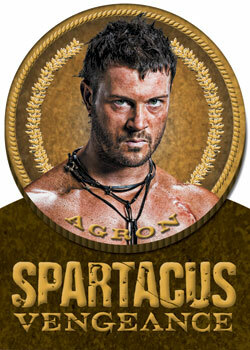 Click here for a complete guide to all Spartacus autographs. 8 cards. Inserted 1 per pack.